I’m a bean muncher. By that I mean I can stand in the garden and happily munch my way through a dozen raw beans at a time. I simply love them, fat and juicy, or skinny and snappy. As a kid I was always told off for eating the beans when sent to pick them for dinner. Couldn’t help it. They were so juicy it was like having a drink. 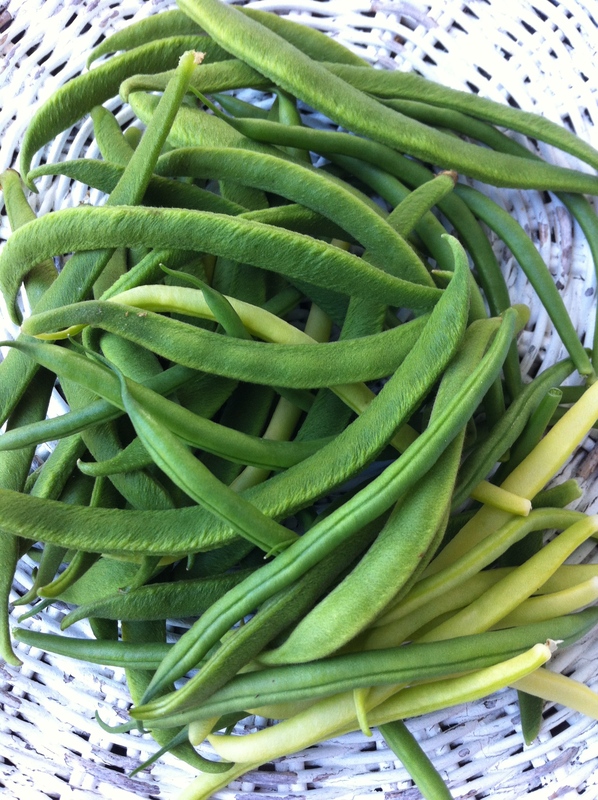 My favourite is the scarlet runner – the very textural green bean in the pic here – because they’re incredibly juicy and have the beaniest flavour. For the moment we are pretty happy just having them tossed in garlic and butter with a sprinkle of sea salt, or doused with a little extra virgin olive oil and garlic with a cap of grated parmesan. There’s time for stewing them Spanish style with clams, or smothering them with pungent Indian spices. We’ll make summer minestrone or garbure Basque later on, and toss them with toasted cashews and strew them with thyme flowers when the thyme is flush with flowers again. For now, it’s time to pay homage to my father and brother-in-law Billy. Yeah! My father grew beans well into his late nineties. Tomatoes, too. Of course he liked them well stewed by today’s standards. I know there are two camps when it comes to cooking beans: those who like them firm, (Heaven forbid! Not hard and crunchy, though, so they squeak and fly off the plate when you try to cut them! ), and those who like them cooked until tender. I like them both ways, depending on the dish. Stewed beans are terrific when cooked in anything but water – I’ve never understood throwing all that gorgeous bean cooking water down the sink – and the cooking juices form part of the dish. But I make an exception when it comes to my dad and Billy. You see, they shared a little ritual. They made a meal of a mound of just-picked beans, cooked to within an inch of their lives (yep, REALLY tender! ), tossed in loads of butter and sprinkled with heaps of salt – way more than would be considered healthy these days – and another oddity, a generous dusting of ground white pepper. You know that horrible stuff that makes you sneeze as soon as you sprinkle a dot of it anywhere? Well, somehow they were immune to that. There was always a stack of sliced white bread, the kind that is frowned upon now, but maybe it was made with more integrity back then, and the slices were slathered in butter. Oh, and beer. Cold beer with frothy foamy caps was a hugely important part of the feast. They always seemed to need a couple of refills to get through all the beans. Well, this was New Zealand back in the 60s when no one cared too much about butter and salt intake, when everyone had a home garden, when there was nothing more enjoyable to do on a hot summer’s afternoon with a full crop of beans going begging, than to sit in the shade and eat a stack of them wrapped in buttered white bread while chilling, (HaHa, literally), with a cold beer and a best mate. That’s why I say, all the other fancy-pants bean combinations can wait. For now, it’s time to enjoy the simple things in life. Beans and beer, in the afternoon, when time allows. Not a savvie in sight. ‘Cause sauvignon blanc drinkers be warned, green beans and sauvignon blanc are a truly bad combination. On their own, each is wonderful, agreed, but together they are truly terrible. Like you’ve eaten a bucket of green stink bugs and washed it down with some sad flat sour little wine. Take a lead from my dad and Billy and stick with beer. It’s much better.